Best Air Filter for Dodge Cummins Reviews: Top-5 in April 2019! Cummins is an engine fabricator that produces one of the most prolific and iconic engines of the 20th and 21st century. The first Cummins Dodge Ram engine was introduced in 1989 and was a 5.9L 160 HP engine that evolved over time to the 6.7L 385 HP engine we know of today. Dodge designed the RAM to accommodate the large turbocharged diesel engine in 1989, in 1996 the new engine reached 200HP and the in 2001 it went beyond 500 lbs/ft of torque. In 2007 the 6.7L engine was introduced, and it started with 350HP, this increased to 385HP with 850 lbs/ft of torque in 2013. Today, the aftermarket is full of upgraded components that can add more than 35% of additional HP and torque to the Dodge Cummins engines, and one of these components is the air filter unit. Now let’s take a look at the five best air filters for Dodge Cummins diesel engines. S&B is a well-known brand of aftermarket components. This model is their cold air intake kit for the 2003-2007 5.9L Cummins engine and is engineered to improve the airflow over stock models by 42%. To do this, S&B use silicone seals and couplers instead of standard rubber, silicone withstands heat and lasts longer than rubber and improved the products integrity and performance accordingly. This model also comes with a secondary air inlet that reduces restriction and increases air flow to the engine. The design features a one-piece molded polyethylene box that is totally sealed, preventing excess pollution and engine heat from affecting the cold air flow. This inlet comes with a plug, which will restrict the flow to the stock fender inlet. It also comes with a rubber trim lid that works cohesively with the silicone seals. This product meets MAF mapping and will not cause a DTC error to light up the dash. This S&B air intake filter kit is the perfect upgrade for performance improvements of your 2003-2007 Cummins 5.9L engines. This S&B filter kit is designed for the 2013-2018 Dodge Ram Cummins 6.7L and is also engineered by S&B for performance savings and power upgrades. This kit delivers a great 54.60% improvement over air flow restriction when compared to stock components. What this model comes with an oversized highly-efficient air filter using either a reusable 8-layer Cotton filter or their Dry Extendable filter. There is also a wing gate that provides extra performance during extreme heat conditions, with high loads and high altitudes, and pivots when the truck accelerates using full throttle. The gate opens, giving the grill mounted ram-air duct access to more and cooler air. As with all S&B models, this one uses silicone seals and couplers instead of standard rubber, silicone withstands heat and lasts longer than rubber and improved the products integrity and performance accordingly. You can use the ram-air inlet as a standard, just remove the dam that holds the swing gate in place, and you will have constant cooler air flowing into your engine. When you drive in poor conditions, you can simply replace the dam. This is an exceptionally designed cold air intake filter kit for 2013-2108 6.7L Cummins engines. Obviously, I had to give you the S&B filter kit for the 2007-2009 Dodge Ram Cummins 6.7L models as well. This completes a whole line of engines, and as with the other S&B models, this one also delivers exceptional performance. The 75-5093 provides an optimized improvement of 37.06% better than stock, and as with all S&B models features the closed box system that comes with silicone seals and couplers. The model comes with an oversized highly-efficient air filter using either a reusable 8-layer Cotton filter or their Dry Extendable filter. The lid is transparent on this model, so you can easily see the status of your filter and box. As with the 75-5094, this model comes with a secondary air inlet that reduces restriction and increases air flow to the engine. The design features a one-piece molded polyethylene box that is totally sealed, preventing excess pollution and engine heat from affecting the cold air flow. This inlet comes with a plug, which will restrict the flow to the stock fender inlet. It also comes with a rubber trim lid that works cohesively with the silicone seals. Well that completes the S&B rampage over this review, their filters are exceptional, and this one is no exception to that rule. This is the ultimate replacement air filter kit for all 2007-2009 Cummins 6.7L engines. 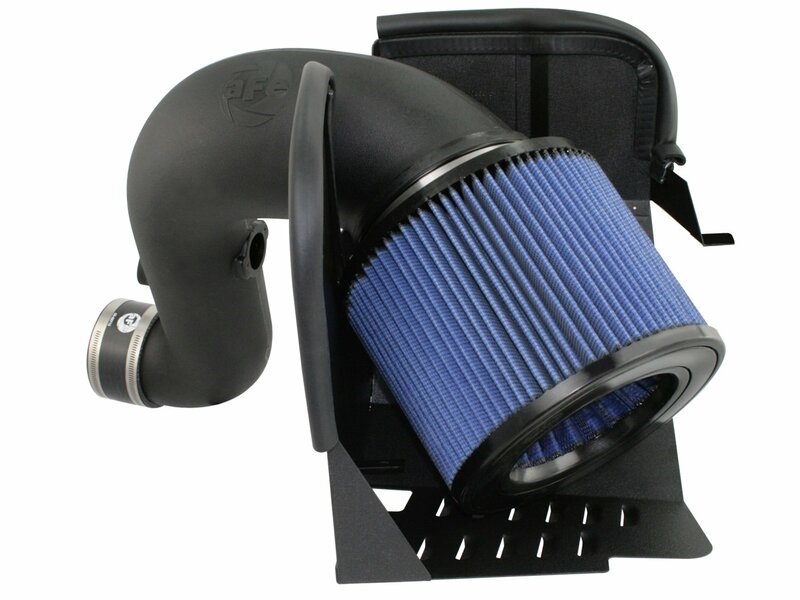 This is the aFe Stage 2 Pro-5R Cold Air Intake System for 2003-2008 Dodge Ram 5.9L/6.7L Cummins. This is an aFe Stage 2 cold air intake kit, as such it delivers an increase of 18HP and up to 24 lbs. x ft. torque. So basically, what you get is a 117% improvement over stock. This model uses the PRO 5R performance air filter; this model is constructed out of 5-layers of progressively finer mesh cotton gauze. The PRO 5R filter body is made from 100% polyurethane that is great for extending life as well as assuring a smoother cleaning. The construct comes with 4-ply silicone couplings which are used to withstand engine compartment temperatures, and this is extenuated by the one-piece powder-coated double heat-shield. There is a molded plastic intake tube that is heat insulating and designed to improve airflow volume while it lowers the Intake Air Temperatures (I.A.T). aFe integrates factory mounting points for a fast installation. The filter itself is a 4″ An inverted cone 360 Degree Air Filter. High performance demands high quality, and the aFe is constructed for delivering the highest performance. This product is an exceptional upgrade kit for your 2003-2008 Dodge Ram with Cummins 5.9L or 6.7L engines. 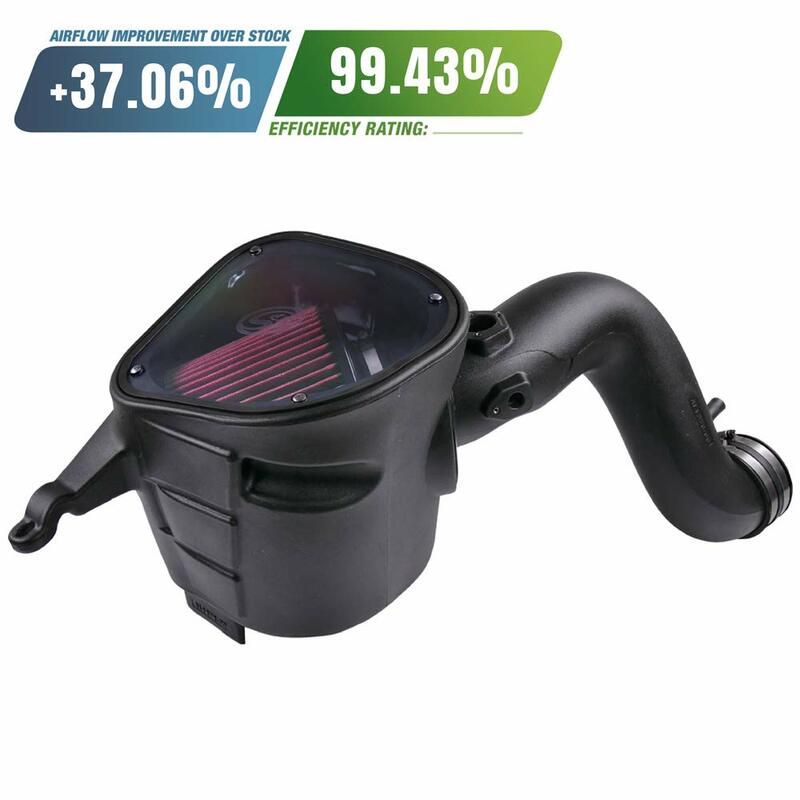 The K&N 77-1568KTK Air Intake for 2014-2018 Dodge Ram 2500/3500 6.4L V8 engines. 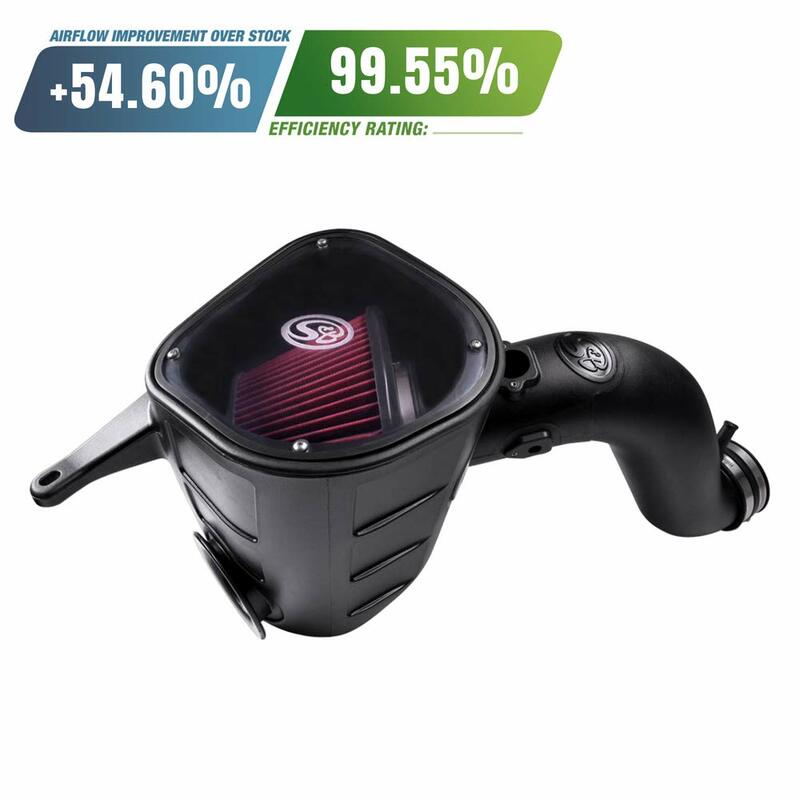 I had to seal this review with the exceptional K&N 77-1568KTK high-flow performance air intake system. This model is used with 2014-2108 6.4L engines, and as a K&N product, you get some exceptional features that match the leaders of this category. 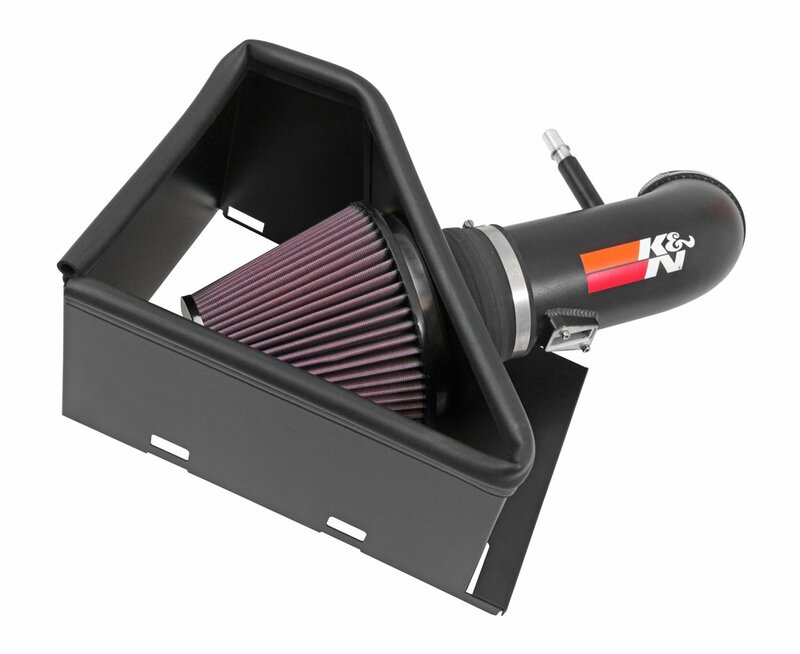 The 77-1568KTK air intake is made using a chrome top integrated with K&N oversized inverted conde shaped high-flow air filter and a heat shield which both install directly into the OEM box. 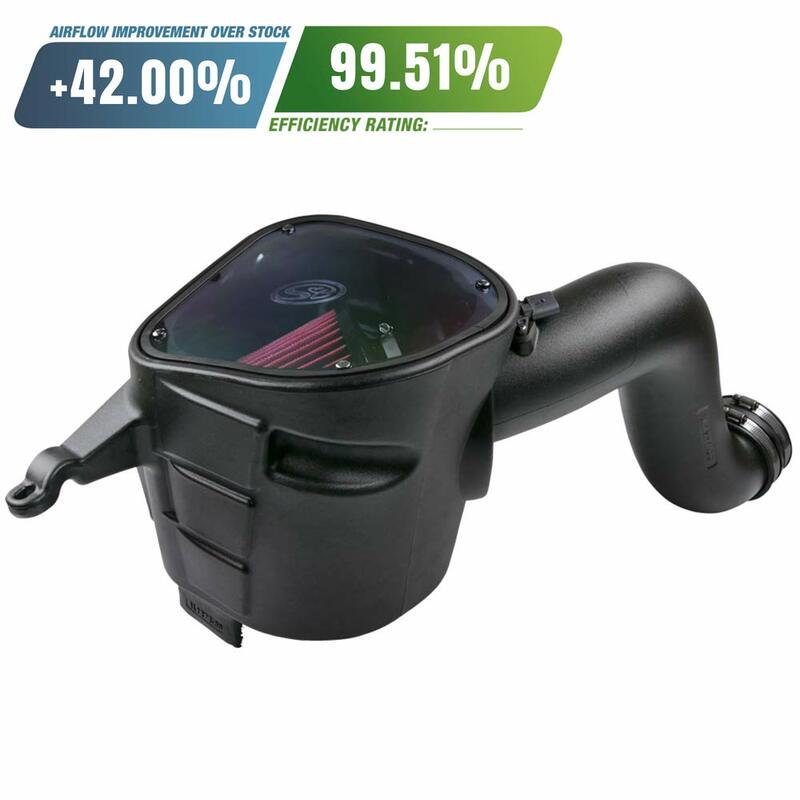 The intake tube is made from aluminum alloy that retains heat outside but maintains a cool air flow inside, and this then coated with a black powder finish that links seamlessly to the factory crank case vent hose and has ports for the inlet air temperature sensor and humidity sensor. This kit takes around 90mintues to install using standard tools with the supplied hardware. The K&N filter is a small beastie, it sits innocently on your engine and supplies it with clean, refreshing air for a cool and powerful drive, and the price is just right.